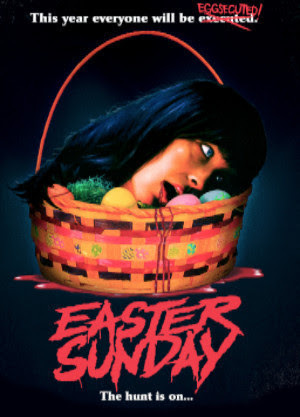 Camp Motion Pictures bring a rare treat to DVD and VOD on the 14th March 2017......a Easter based horror film. EASTER SUNDAY stars Jeremy Todd Morehead, Ari Lehman (FRIDAY THE 13TH) and in one of his final roles Robert Z'Dar (MANIAC COP). You can read our review of the film by clicking here. A group of hard partying teenagers set out to raise some hell. Instead, they raise the DEAD. It's been 24 years since the deranged serial killer Douglas Fisher was executed by police on Easter night, and his gruesome story became a terrifying urban legend. Then, during a drunken campfire ritual, a group of teens accidentally conjure the spirit of Douglas Fisher... aka the bunny masked killer! Unless they can stop him before Midnight on Easter, the evil bunny slasher will tear their town and everyone in it into pieces. So lock your doors and hide, or there will be no candy in your Easter basket - just the limbs and body parts of your family and friends! Doug Fisher kills everyone in sight, if you're not careful he’ll take your head this Easter night. It is also available to order at Amazon.com at the link below.